I hope you had a wonderful New Year's Eve and are looking forward to a bright start to 2018, whether you choose to plan for the months ahead or just go with the flow. Personally, I like to make new year resolutions - and here are mine for 2018. Rather than just making a single resolution, I make a list of at least 10 things I want to achieve over the year. I find that if I write a list of several things I have a good chance of succeeding in at least some of them. In 2017 I did seven of the 10 things I hoped to do - which is about the number I usually achieve. I don't think I've ever scored 10 out of 10, but that's okay. My book Pagan Portals - Poppets and Magic Dolls is due to be published in the summer and I aim to do some talks or workshops covering a few of the things in it. Create a candle labyrinth. I meant to do this last year, but didn't get around to. I am keen to do it in 2018. Try out a different craft project every month. Last year I made 12 mandalas from natural objects to represent the cycle of the seasons and enjoyed that. I also spent a lot of time making different types of poppets as research for my book, but now I fancy more variety in my crafting. Visit at least one ancient site I haven't yet blogged about before. This is something on my list every year, but there are still plenty of places to visit. Visit somewhere connected with the history of witchcraft that I haven't visited before. Explore more of London on foot and write about aspects of the city I've not yet blogged about. Back in 2016 I wrote a post called Tales from the Witch Room - about decorating the room in my house where I keep all my witchy books and magical tools. I've got so many treasured items in my witch room that I thought I'd blog about some of them. I'm going to plan a monthly post. Attend at least one large pagan open ritual for a Wheel of the Year festival and blog about it. Last year I mainly went to small, private celebrations and it has been too long since I've been to a public event of that kind. Try out at least half a dozen guided visualisations from published books or audio recordings and review them. I have quite a few that I've acquired but not done. This would be a good incentive to get around to doing them. 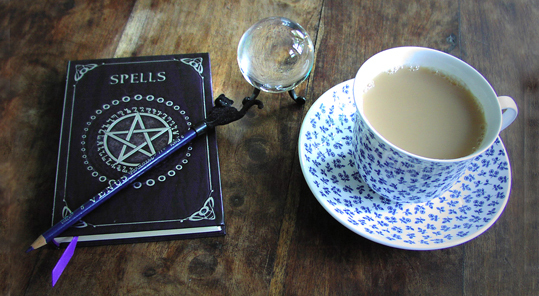 The photo at the top was taken in my witch room and shows one of my crystal balls, a lovely notebook that says "spells" on the front, a pencil topped with a fuzzy black cat and a very large cup of tea.